Who can blow our minds better in 140 characters—the El Bulli boss or the Karate Kid? But the line between profound and preposterous is finer than shaved Serrano ham, and between the mind-melting explosions of his casually-dropped thought bombs, Adrià can occasionally sound like a stoned Sun Tzu giving a TED talk. It’s at these moments that he begins to stray into Jaden Smith territory, that punctuation-murdering hormonal peddler of bumper sticker philosophy. We like to picture tears running down the 16-year-old’s face as he nocks another arrow of truth into his bow of realness, and prepares to pierce our consciousness because, like, knowledge is pain, you guys. When You Live Your Whole Life In A Prison Freedom Can Be So Dull. Water In The Eyes And Alcohol In The Eyes Are Pretty Much The Same I Know This From First Hand Experience. It got us wondering: In a blind comparison, could you separate the motivational musings of a pseudo-deep adolescent from the rambling advice of a celebrity chef that apparently orbits earth’s outer atmosphere? See if you can guess who authored these tweets, and then scroll down for the answers. 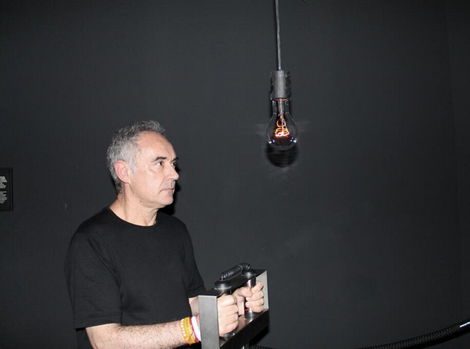 Who Tweeted It: Jaden Smith or Ferran Adrià? 1. Our sickness today is that we don’t copy each other. 2. The people that truly understand your art are the people who don’t comment. 3. You can discover everything you need to know about everything by looking at your hands. 4. The first commandment about vanguard is that no one understands you. 5. You would have to eat five apples today to get the same nutritional value as an apple in 1950. 6. Is #philosophy the hard drive of reflections? 7. Don’t follow. Just listen, and then make your own path. 8. The best way to experience life is to experiment. 9. There comes a moment when you’re fighting only against yourself. 10. Pay attention to the numbers in your life. They are vastly important.